Thank you! I work for you. David seems to consider his father lying there on the couch, perhaps thinking about how much he’s aged since the heart attack, or perhaps noting how he is not sleeping in his mother’s bed. David goes outside to sit on the step and think about what life dealt him today. This is everyone’s love story right now, yours and mine. And let us rejoice in the smouldering exchange of eyesight these two young lovers pass across the universe at one another, a million little babies conceived as they wrestle with each other’s flesh in the muscle of their minds. Skin on skin. The explosions cast light over the birth of their love. During this episode, David is still in the 'Refusal Of The Call Phase' of the Hero's Journey and things are turning sour quickly. Note how his actions within this position, no matter how well-intentioned, actually drive Karen away. I'm reminded of the owl invasion in Harry Potter & The Sorcerer's Stone, the more Uncle Vernon does to avoid it, the worse it becomes. 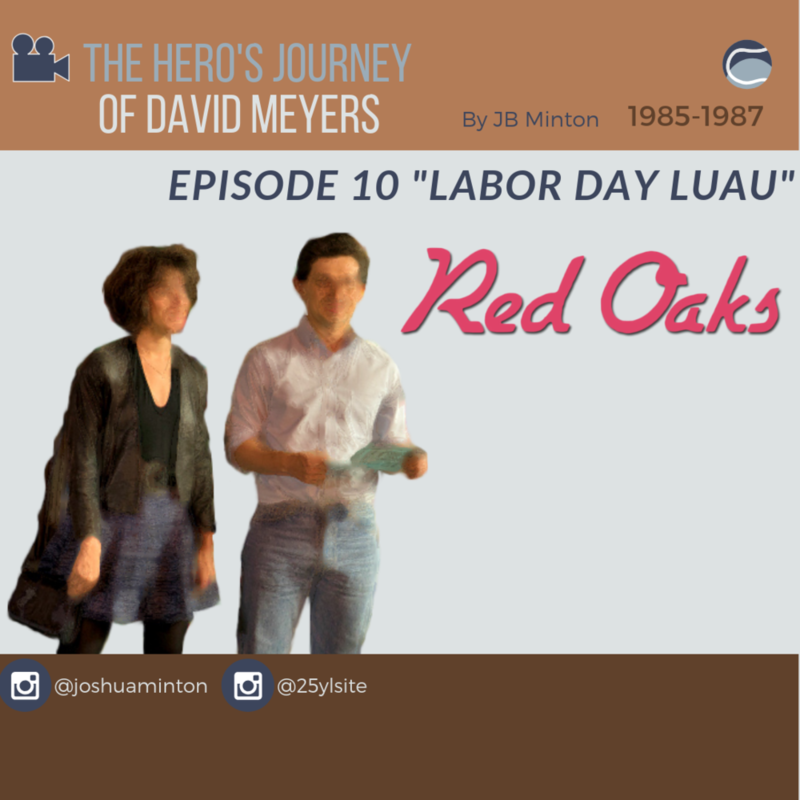 Fate comes like fire to Red Oaks. In this third episode of Red Oaks, “The Wedding,” we see what happens when David takes the straight path. Things seem...safe. There is a tradition in The Hero's Journey where the Hero refuses the Call to Adventure. Sometimes this refusal can take the form of the hero taking the safe path. This is what David is doing and, on the surface, it will seem to pay off. But destiny has a way of interfering when our heroes least expect it. This episode is the beginning of David learning that lesson. Red Oaks, New Jersey, and the entire world was starting to suffer from a symbolic deficiency in 1985. In this author's opinion, we are dying from its absence today as of the writing of this article. We need artists to break us through, now more than ever. Is David going to be one of those artists? He still doesn't know. He's still standing firmly inside the Call to Adventure. He just fought and won the biggest battle of his life when he defeated Getty 6 games to nil in tennis, and don't forget he was wasted just a few hours before these matches happened. And at the end of that terrible ordeal, he stood supplicating in front of Skye Getty, his rock of Gibraltar were we to compare him to Hercules for a moment. I think the Red Oaks Pilot episode of the Amazon Studios show is one of the finest first episodes of any show ever made. I would certainly put it in my top five. As co-creator of the Red Room Podcast, now nearly ten years old and with over 160 episodes, Scott Ryan and I have made a lot of lists. Like Jack Black's character Barry Judd in High Fidelity, we believe the list of defined values in Television is critical to anyone who wants others in the TV Analysis gig to take them seriously. So I want you to understand what it means when I say I think this show is one of the best of the best and I'm using this article to kick off the long, episode by episode, argument I'm going to make for you to watch it over and over again and hopefully love it as much as I do. I'm even pulling in one of my biggest influences in life to help me out with this.